Newly protected lands in Columbia County.Robert Rodriguez, Jr. Bringing to nearly 500 acres the scenic, ecologically important land we’ve conserved along Stockport Flats, these forests, meadows, ravines and wetlands are located between the National Estuarine Research Reserve and the Greenport Conservation Area (preserved by the Open Space Institute and managed by the Columbia Land Conservancy). This purchase completes a contiguous swath of protected riverfront of more than 1,200 acres, encompassing over 2.5 miles of Hudson River shoreline running north from the City of Hudson. Previously approved for a 24-lot residential subdivision, this land lies within the Columbia Greene North Scenic Area of Statewide Significanc—designated by the New York Department of State for possessing outstanding scenic resources, including dramatic shorelines, expansive views and working landscapes. It also is within the state-recognized Stockport Creek & Flats/Nutten Hook/Gays Point Marsh Biologically Important Area (BIA). The A rating assigned this BIA by the Department of Environmental Conservation and its conservation partners means these wildlife habitats are of the highest importance. From the property’s upland plateau there also are spectacular seasonal views of the Hudson River and Catskill Mountains. 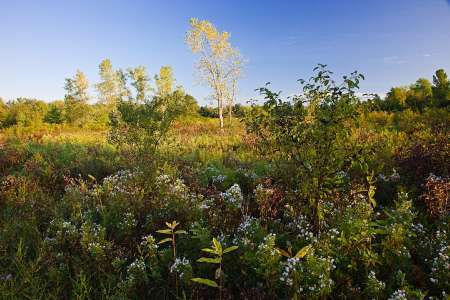 And it features prominently in vistas from our Four-Mile Point Preserve across the river in Coxsackie, Greene County, as well as from the adjacent Vosburgh Swamp Natural Area, also protected by Scenic Hudson. The purchase is part of Scenic Hudson’s collaborative campaign to Save the Land that Matters Most, protecting 65,000 acres of great scenic, ecological and agricultural significance.